Che'lu Bar & Grill - SSC-R battles Zark's Burger Jawbreakers - LPU in Game 2 of the 2018 PBA D-League Aspirant's Cup. It's a chance for Che'lu to win the crown, while Zark's aims to force a winner-take-all Game 3. SSC-R defeated LPU in Game, 107-103, behind Samboy de Leon, who scored 18 points on a 4-of-5 shooting from three-point area. 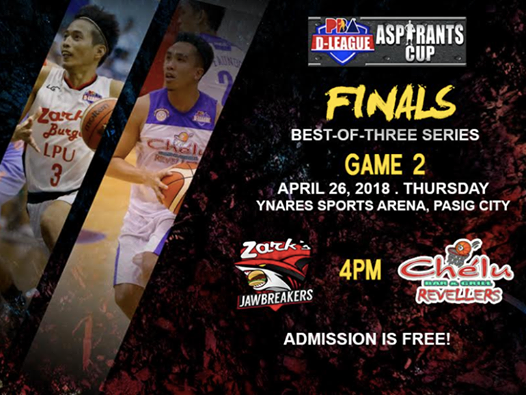 Here is the details for Game 2 of Che'lu - SSC-R vs. Zark's Burger - LPU in the Finals of the 2018 PBA D-League Aspirant's Cup. The Zark's Burger - LPU defeated Che'lu - SSC-R in Game 2 to even the series and forces a decisive final game on Game 3 (May 1).